Macarons used to terrify me. Not eating them… that was easy enough. Making them though scared me so much that I very rarely attempted them. My very first attempt, shockingly, was a success. Others after that were a disaster, with nothing but cracked macarons, very unelegant! There are 2 methods of making macarons, French or Italian. A lot of my friends advised me to try the Italian method as that seemed to make the shells more stable. That method involves boiling sugar and water and adding it to the egg whites. I can be a real stickler for detail though, which can be a real pain in the backside. The stickler in me decided that as macarons are a French treat, I wanted to be able to make them the French way. I found a wonderful book in a set of 3 published by Love Food. This book is called Macaroons and has lots of different recipes. I’ve tried a few now and each time they’ve come out perfectly. My Persian Love Cake Macaron recipe is based around the recipes I picked up from this book. The story of the Persian Love Cake is a beautiful tale of love and romance, which really appeals to me. Depending on which version you follow, it shows that the way to a man’s heart really is through his stomach! A lady fell in love with a Persian prince and baked him a beautiful cake as a symbol of her love. In the version I like to believe, the prince fell in love with her and they lived happily ever after. In the other version, the prince was allergic to one of the ingredients and died. Boo hiss. I don’t like that version! There are nuts in these macarons though so make sure the person you give them to doesn’t have a nut allergy!!! The macaron shells are flavoured with cardamom and rosewater. You can buy ground cardamom but the very best flavour and aroma comes from grinding them yourself. For baking purposes, you need green cardamom pods. Black ones are much more savoury and not suited for sweet bakes. The pods are quite hard, but break them open to reveal the cardamom seeds. It is these that you need. Grind them as finely as you can using a pestle and mortar. You can buy them in the spice section of supermarkets, or a great online seller for all your spice needs is The Spiceworks. 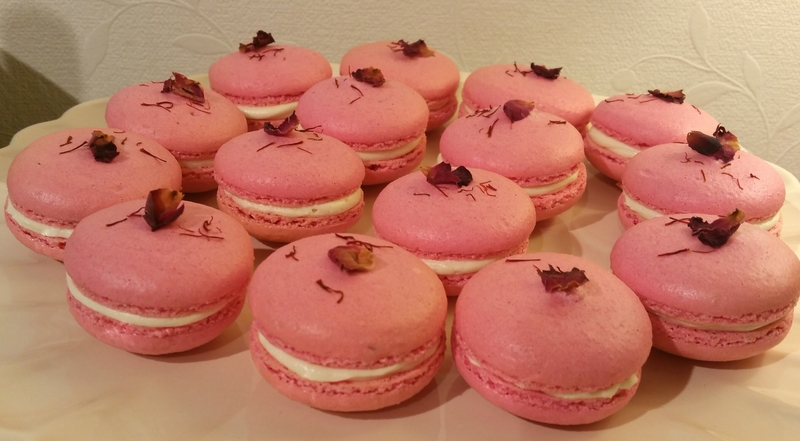 They also sell dried rose petals in various sized bags, which are used to decorate these macarons. Another ingredient in Persian Love Cake is saffron, the most expensive spice in the world. It is derived from the stigmas of the crocus flower, and is handpicked as there is no machine capable of such a delicate job. 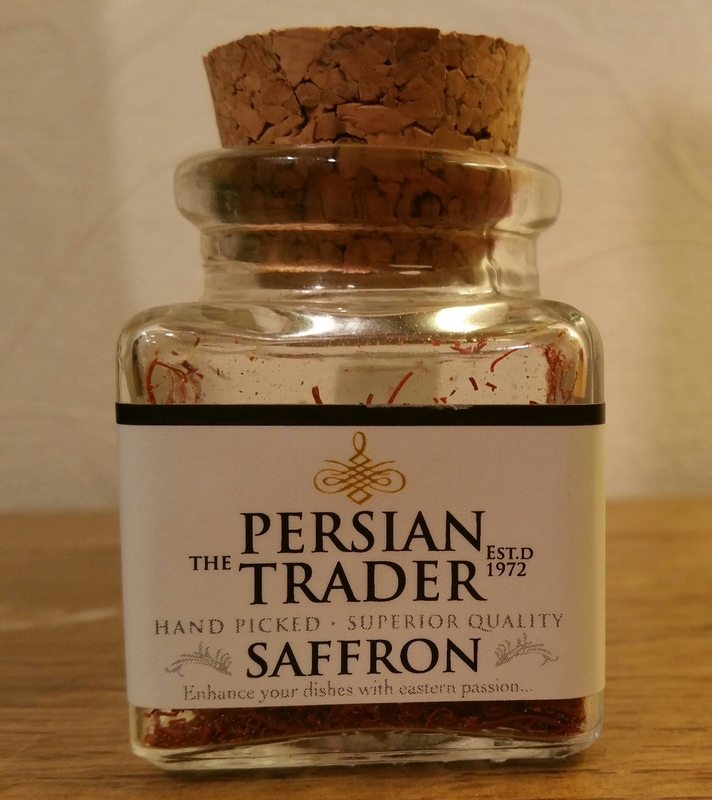 I use saffron from The Persian Trader. They only use the most superior grade of saffron from farms in North Iran, with the most intense colour, flavour and aroma. Cheaper versions can be bought but they are sometimes artificially dyed or mixed with less superior grades. As saffron is so expensive, you may as well make sure you’re getting the very best for your money. And believe me when I say you only need to use the tiniest amount, so a jar lasts forever! Persian Love Cake is also flavoured with pistachio nuts. As macarons already have ground almonds I didn’t want to add extra nuts but wanted the flavour of the pistachio. As you know, I’m a huge fan of Monin syrups and had a bottle of pistachio syrup already. This was perfect to make a pistachio buttercream. The flavour was all there but the texture was beautifully smooth. Enough waffling… here’s the recipe. Using a food processor fitted with a sharp blade, blitz the icing sugar, ground almonds and cardamom until it is like powder, around 20-25 seconds. Sift this into a small bowl using a fine-meshed sieve. If there are any bits left in the sieve, throw them away. In a large bowl, whisk the egg whites until they form soft peaks. This means that when you lift the whisk, peaks will form but the tips of them will fold back over. I find it is best to use an electric handheld whisk for this, but you can use a stand mixer if you prefer. Add the caster sugar very gradually, whisking well each time you add any. The meringue mix will become glossy. 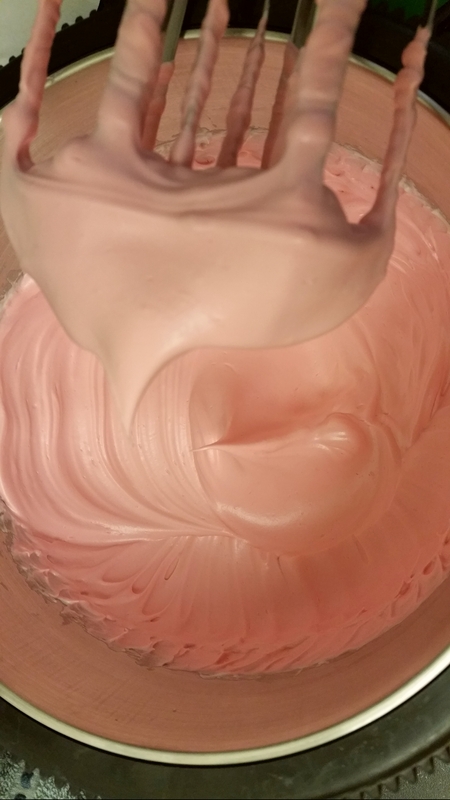 Add the rosewater and enough food colouring to give the meringue a beautiful pink colour, and whisk until the mixture forms stiff peaks. This means that when you lift the whisk, peaks will form and will not fold over. This next part is the stage that is most likely to cause problems if not done right, so be extra careful at this point. Tip a third of the almond mixture in with the meringue and use a flexible spatula to very gently fold the dry mixture in to the meringue. I scrape around the bowl, then lift the mixture from underneath and fold it over, occasionally cutting through the middle. When it is all combined, tip another third of the almond mixture in and repeat. At this point it will start to firm up a bit. Finally add the last third of the almonds, and fold as before until fully incorporated in to the mixture. It will be quite firm now. Keep folding gently until the batter loosens a bit. When it is ready to pipe, it will be glossy and smooth, and when you lift the spatula out of the mixture and let some fall off, it will lie in a trail on top of the batter for around 30 seconds without losing it’s shape. If you over-mix at this point allowing the batter to go too runny, your macarons will not hold their shape when piped. Line 2 baking sheets with baking paper. (I have a fan oven, so to make sure the breeze from the fan doesn’t lift the paper, use a tiny bit of the meringue mixture left on your electric whisk to stick the corners of the paper to your baking sheets). Spoon the mixture in to a large piping bag fitted with a 1cm plain nozzle. Or if you are using disposable piping bags, just snip the end off to make a 1cm opening. Pipe 16 macarons on to each sheet, around 3 cm wide. To do this, just hold your piping bag vertically almost touching the paper, and squeeze until the mixture spreads to around 3 cm. Lift and repeat to pipe 4 rows of 4 shells on each sheet. Hold the baking sheet with one hand and very firmly tap all along the underside with your other hand. Or gently tap the sheets on to your worktop. This helps to get rid of any air bubbles. The macarons will spread very slightly as the action flattens them a bit and gets rid of any peaks from the piping. If you do still have any peaks, lightly wet your finger and gently smooth them down. 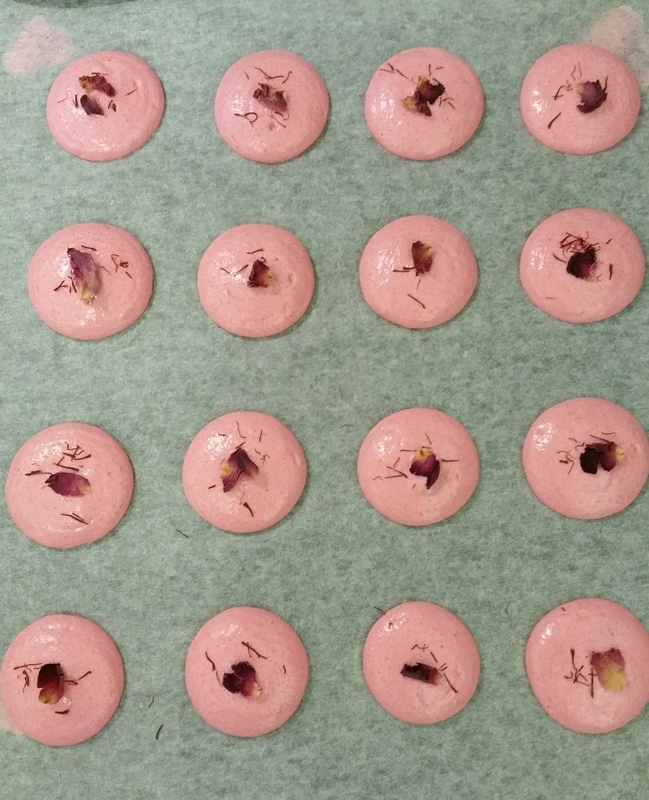 Carefully place a rose petal and a few strands of saffron on to 16 of the macaron shells. Saffron tastes very strong so don’t put too many on! Leave the macarons on the side at room temperature to stand for around 30-40 minutes. They need to dry out a bit so that they bake evenly without cracking. They are ready to go in the oven when you can gently touch them without any mixture sticking to your finger. They will also lose their shine as they dry. While they are standing. preheat your oven to 140C fan, or 160C conventional oven. Bake one sheet at a time for 10-15 minutes. (They take 10 minutes in my oven). Check them after 5 or 6 minutes and if they look like they are browning, turn your oven temperature down slightly. To test if they are ready, gently nudge one of the macarons. If it wobbles on its base, it needs a little bit longer. If it has a crisp shell and doesn’t move, it is ready. Remove from the oven and leave to cool on the baking sheet for 10 minutes. Cover a wire cooling rack with a piece of baking paper, gently peel the macarons off the baking sheet paper and place them on the wire rack to cool completely. While they are all cooling, make the buttercream. Place the icing sugar, butter and pistachio syrup into a bowl and beat until light, fluffy and smooth. Use a piping bag with a small nozzle or cut a small opening on a disposable piping bag, and pipe buttercream on to the macaron shells which don’t have the rose and saffron on them. Then place a decorated macaron shell on top and gently press together. As these are based on a royal story, I wanted to make them extra indulgent, so brushed some gold lustre dust around the tops of them. You don’t have to though if you don’t want to. Eagle eyed readers will notice I said pipe 32 shells but I only have 15 complete macarons in my photos. I couldn’t resist instantly sampling one before the photos were taken. My willpower is sadly lacking!!!!! These would make beautiful gifts for loved ones, or wonderful wedding favours. What better way to celebrate a union of love than with these romantic treats. Whoever you make them for, I’m sure they’ll be very gratefully received. 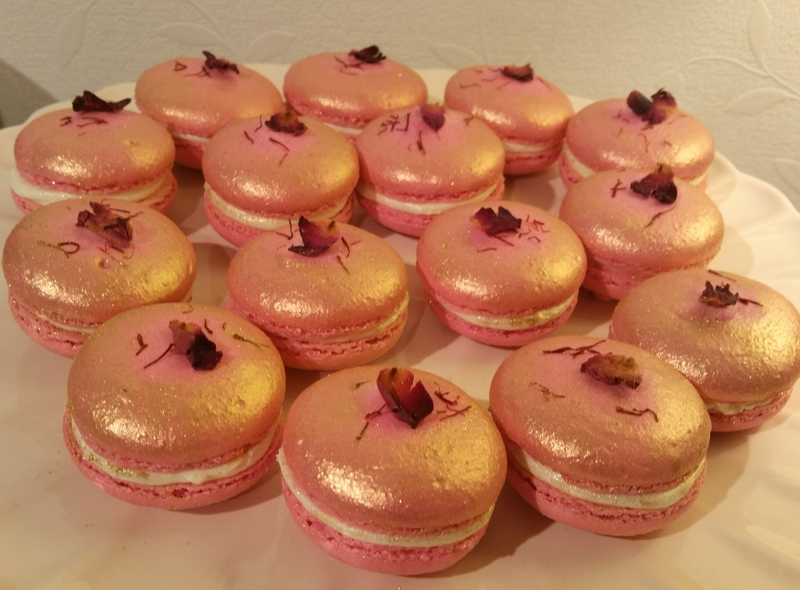 I was so pleased to see this post on macaroons as I am dying to try to make them. I have saved this for future reference.